Find a therapist in Connecticut with GoodTherapy.org. The United States Census Bureau estimates roughly 3.5 million people lived in the state of Connecticut in 2015. Information gathered by the Bureau of Labor Statistics (BLS) suggests approximately 34,870 residents work as psychiatrists, child psychologists, corrections officers, workers in religious fields, School guidance counselors, clinical social workers, health educators, and marriage and family therapists in Connecticut. According to the BLS, residents who work in these and other community and social service fields earn a mean annual salary of $53,560. After the 2016 edition of the State of Mental Health in America survey was completed, Connecticut received an overall ranking of 3rd from Mental Health America (MHA)—when compared to 50 states and the District of Columbia. This high overall ranking was due primarily to consistently high marks across a range of measures for low rates of mental health issues and high rate of access to care. For example, Connecticut was 1st in adult ranking, 5th in youth ranking, 8th in overall prevalence ranking, and 4th in access to care. MHA researchers contend that these statistics correlate with social factors such as low rates of poverty, low rates of obesity, and low rates of toxic chemical release in the state. At about 17%, Connecticut has one of the lowest percentages of adults with mental health issues, while just less than 4% of people in the state had seriously contemplated suicide. The state received a high ranking of 8th in each of these categories. The 2016 MHA study also says just over 9% of adult who experience mental health concerns are uninsured; the state obtained a ranking of 6th in this mental health metric. While Connecticut received several high rankings in adult care measures, the state received somewhat lower rankings in care for young people. MHA researchers and therapists in Connecticut report that the state was ranked 19th for young people with an episode of major depression in the past year; 16th for young people with abuse of drugs or alcohol; and 24th for young people with severe major depression symptoms and episodes. According to the 2016 MHA survey, 24% of teens who experience major depression will obtain some treatment for depression —giving the state a ranking of 23rd in this category. 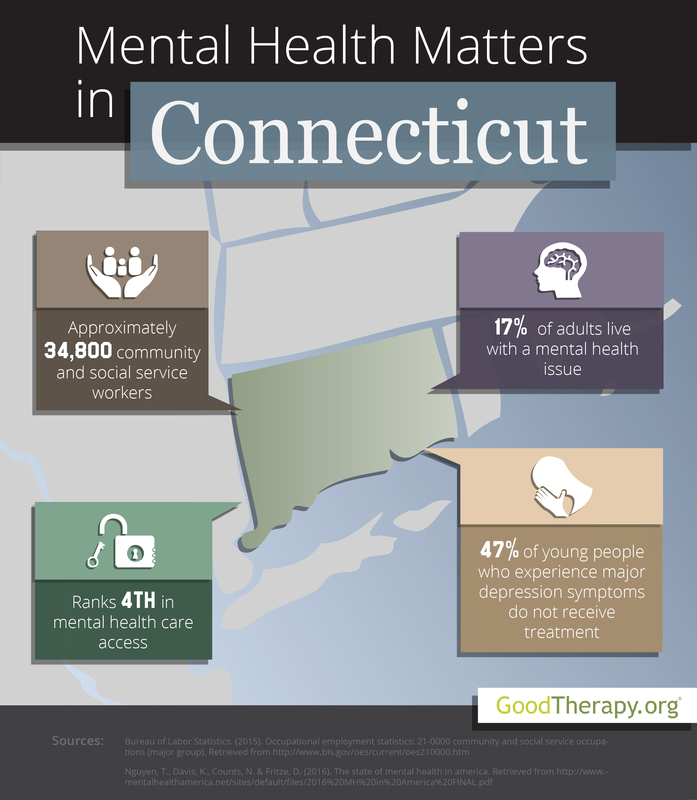 Despite these findings, the MHA survey shows Connecticut does have some mental health care provisions in place for the younger population. The state has the fourth lowest percentage of adolescents with major depression who did not receive treatment and the highest percentage of children with insurance that covers mental health issues.